A JUST AND HOLY CAUSE? details the life of the family of Lieutenant Marcus Bethune Ely and his unit, the Russell Guards (Co. H, 54th Georgia Regiment) in the midst of one of our country’s greatest tragedies. The Russell Guards were organized in Columbus, Georgia by Captain Charles R. Russell in May 1862. Most of the recruits were from Muscogee and Harris County. The first two years of letters recount the life of a soldier living on the coast interspersed with life back home. Ely’s letters are filled with accounts of happenings from the spring of 1862 until late April 1864 in the coastal area from below Savannah, Georgia to Charleston, South Carolina. During this time the soldiers were well fed and housed. 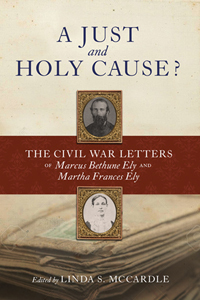 Letters from Ely’s wife Martha describe day-to-day life as well as hardships at home. In late April 1864, the tides turned drastically for the Russell Guards. They boarded a train in Hardeeville, South Carolina and arrived in Dalton, Georgia, as Sherman’s forces swept in from Tennessee and became involved in battles in Dalton, Dug Gap, Rocky Face Ridge, Resaca, New Hope Church, Kennesaw Mountain, Peachtree Creek, and others in the Atlanta area. After the fall of Atlanta, as a part of the 54th Regiment, they marched into Alabama, Tennessee, and Mississippi. As Ely and the Russell Guards are thrust into the fierce fighting, he describes the hardships, lack of adequate clothing, and scarcity of food for the men in vivid detail. These letters provide a picture of life on both the battlefield and the homefront, often touched with humor and love.